Many equipment failures in a shop can be traced to a lack of preventative maintenance. The StingRay automatic lubrication system ensures critical bearings are properly lubricated on a regular basis. 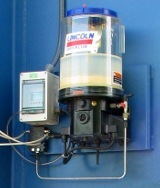 The automatic lubricator eliminates the regular maintenance task of your operators. The system safeguards equipment and prevents downtime by providing the proper lubrication automatically. The automatic lubricator doesn’t forget and doesn’t miss work. A common error is using the wrong grease in critical bearings leading to failure and downtime. Eliminate this mistake with the lubrication system that always uses the proper grease. Proper amount of grease - every time! The Automatic Lubrication System is fully adjustable through easy to use programmable Controller. The system delivers a specified amount of grease based on parts washer use time. Gear Driven Pump, Reservoir and proportioning valve deliver the proper amount of grease to each bearing. Stainless Steel grease lines and fittings eliminate corrosion issues.